Wayne Green was born in Oakland and spent his entire life there. Wayne graduated from Castlemont High School and attended Chabot College studying Construction Management. After attending Chabot College he became a carpenter and remained in the construction industry until he retired. Wayne met his wife Pat in high school and they have been married for 45 years. Wayne & Pat have one daughter, Christine, son-in law, Randy, and two grandchildren, Makenna and Aidan. After marrying into a “Masonic Family”, Wayne was made a Master Mason in 1971. 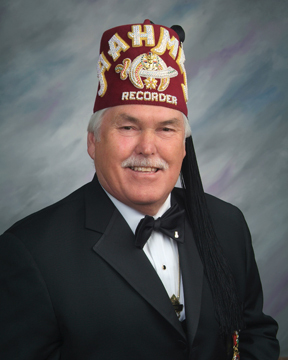 He joined the Oakland Scottish Rite Bodies and received his 32nd degree in 1976. Wayne then joined Aahmes Shrine in 1989. He served as Chief of the Aahmes Alchemists Clowns in 1996. He still is an active member in the Alchemist Clowns and can be seen in costume in parades. Wayne is presently President of the Aahmes Golf Club and can be seen on various golf courses the 1st Monday of each month attempting to improve his score. Wayne was very active with the Masonic youth group Jobs Daughters Bethel 247, Danville. Wayne served at Associate Bethel Guardian for one term. He currently resides in Brentwood with his wife, Pat and dog, Maddie. In his free time, Wayne enjoys golfing, R.V.-ing with all his “friends” and having fun with his grandchildren.